Home › Marriage minded Dating › Are you hanging out with other Marriage Minded People? You know the expression, “A bird of a feathers flock together. It’s so true! I find the company we keep affects all aspects of our lives. And if you are marriage minded, it is important to hang out with other marriage minded individual instead of hanging out with people who shun marriage minded dating and tell you to chill! When I was single I found myself around women who where negative about dating and men, in general. I realized this did not serve me and separated from this group of women. I started to hang out with positive, encouraging people. I even sought out the support and counsel of a coach. I participated in a group for singles looking for serious relationships. I enjoyed the learning and being with other supportive, seriously minded singles. Now I can offer a similar opportunity with my Motivated to Marry Dating Secrets Group Coaching program (http:///www.MotivatedtoMarryCoachingProgram.com) to a group of courageous individuals who dare to call themselves Motivated to Marry. Here you will learn my proven system to attract the right person for lasting love and learn from what the others bring to the group. You will be exposed to all kinds of perspectives. This broader view will open up new opportunities for you. What is great is you can do this from the comfort in your home in the evening by telephone. I have been running coaching groups for over six years, refined my process and offer a very robust program that focuses on what you need to know to connect with the right person and orient the relationship towards marriage. The bonuses of the Motivated to Marry book, the Successful Internet Dating Program and a laser coaching session with me alone make it worth joining this coaching program. As one who has been reading my blog, isn’t time to stop dipping your toe into the pool and jump in with your whole body to take focused action in behalf of finding lasting love? It can only enhance your body of knowledge and overall life experiences. Where are you currently going to meet the one? What’s your plan of action for dating? And have you been connecting with other marriage minded individuals for dating? This curious coach would like to know! So join today at www.MotivatedtoMarryCoachingProgram.com and you can start working with the bonuses right away – and do the pre-work before for our first group coaching session on June 12th. 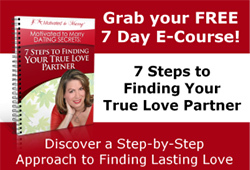 I look forward to supporting you on your journey to finding lasting love! PS. If you would like to discuss if my upcoming Motivated to Marry Dating Secrets Group Coaching program is right for you in order to find lasting love, then fill out my form at www.TalkwithCoachAmy.com. We can have a brief exploratory conversation about how we can get you on the path to finding lasting love! My clients are all over the US and abroad, as well! PSS. If you haven’t been able to listen to my recent teleclass “The 7 Secrets to Finding Your Motivated to Marry Mate”, you can listen to the replay at www.MotivatedtoMarryCoachingProgram.com. Remember, the EARLYBIRD savings on the program ends June 5th at midnight!